More than one-fifth of current greenhouse gas emissions in the United States could be kept out of the atmosphere and stored in the land, according to new research. A study led by Joseph E. Fargione, director of science at The Nature Conservancy, looks at the natural solutions that could help the US do its part to keep global warming below 2 degrees Celsius (approximately 3.6 degrees Fahrenheit), the goal adopted by the 195 countries who signed the Paris Climate Agreement in December 2015. Fargione and team examined 21 natural climate solutions that increase carbon storage and help avoid the release of greenhouse gases into the atmosphere, including conservation and restoration initiatives as well as improved management of forests, grasslands, farmlands, and wetlands. According to a study published in the journal Science Advances last week detailing their findings, the researchers’ analysis reveals that all of these natural climate strategies combined could reduce global warming emissions by an amount equivalent to about 21 percent of US net emissions in 2016. The majority — some 63 percent — of the climate mitigation potential of natural solutions in the US is due to increased carbon sequestration in plant biomass, with 29 percent coming from increased carbon sequestration in soil and 7 percent from avoided emissions of methane and Nitrous oxide. 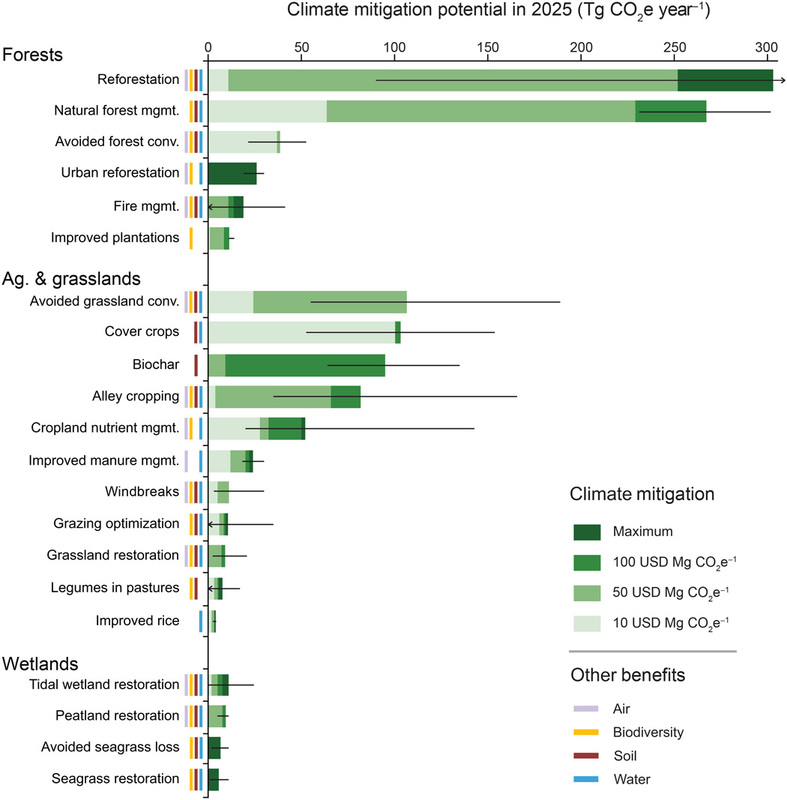 Of the 21 natural solutions the researchers analyzed, increased reforestation efforts had the largest carbon storage potential, equivalent to keeping 65 million passenger cars off the road. Forests provide a number of other solutions with great potential, such as increasing carbon storage by allowing longer periods between timber harvests and reducing the risk of mega-fire through controlled burns and thinning of forests, the researchers found. Fargione and his co-authors note that close to a million acres of forest in the US are converted to non-forest every year, mostly as a result of suburban and exurban expansion and development, but that this source of greenhouse gas emissions could be addressed with better land use planning. US President Donald Trump has said he plans to withdraw the United States from the Paris Climate Agreement, but the earliest any country can do so is 2020. The US’ Nationally Determined Contribution under the Paris Agreement calls for the country to reduce greenhouse gas emissions 26 to 28 percent below 2005 levels by 2025. Reaching that goal will require the US to drastically scale back the burning of fossil fuels, but this new study shows that NCS will also have a crucial role to play. Forest in Borderland State Park, Massachusetts. 35 percent of the climate mitigation potential of reforestation in the United States occurs in northeastern forests. Photo via Wikimedia Commons, licensed under CC0.